Cyclists, rejoice — your time is here. 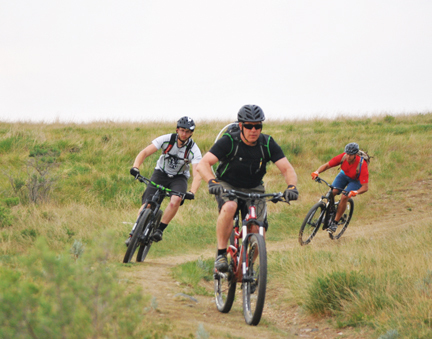 With the -40 degree winters in the rearview mirror people are now able to get on their bikes and hit some of the many trails Medicine Hat and the surrounding areas have to offer. The 670 Collective Mountain Bike Club operates in the areas in and around the Hat and it spends time riding on and taking care of the various bike trails in the area. “The trails actually look really good,” said 670 Collective past president Blaine Fairbrother. “It looks like things wintered fairly well out here. The group focuses on Redcliff, Cypress Hills and Medicine Hat and Fairbrother says people should have their pick of any trail to ride quite soon. “With the way the weather is going, it won’t be long,” he said. “Things are getting really dried up and it looks like the warm weather is going to keep coming. The 670 group meets Wednesdays in the spring and summer to go for rides and Thursdays holds a ladies riding night. The group sat at 160 members last year and is hoping to surpass that this year. Fairbrother says a number of factors play into how the trails weather over the winter and that it is not smart or safe to try and ride on a wet trail — adding that riding on a wet trail can damage it and make it more difficult for others to use.